I, amongst many many other people, used the extra day we have this year and blogged on Feb29th.net. Brainchild of @deputymitchell to get the world blogging in a simple and easy way, Feb29th.net has collected flags from 91 nations and been visited over 21,000 times. 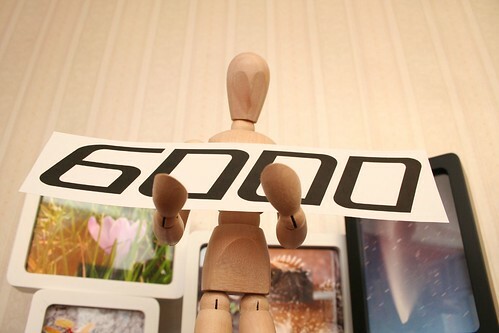 More importantly, thousands of people, young and old have added their post, however short, to the project. If you look at the tag cloud on the website, it’s great to see the size of the Under12 and 12-17 tags – the bigger the word, the more it appeared. I read several posts and this one caught my eye. I hope “Harry Gardner” doesn’t mind me copying his blog post – did ask him in the comments! 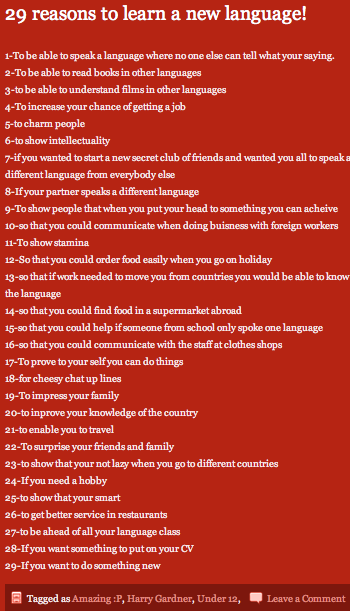 Love that an under 12 has chosen to post so many reasons for language learning! I love number 6, and can tell you that you do need number 11 to learn a language (intensively especially!) as it doens’t just happen. Unfortunately. It seems that someone likes my blog as ¡Vámonos! has been nominated for The Education Blog Awards. Not sure who the kind person who nominated me was, but thank you! If you feel like voting, click on the lovely badges below and you’ll be taken to the place to vote. There are lots of other blogs there that I’d encourage you to peruse, especially the class and school blogs written by and for children. The top ten in each category will then be judged by the illustrious panel to choose the winners. Don’t think for a moment that I’ll win but it’s good to see primary languages represented on the list! I love it when I open my Inbox and come across an email that points me to a new resource. I received one such email tonight and loved it so much that I had to blog it immediately. page you can set up some restrictions in terms of viewing and posting. Jimmy posts an example that he’s made with his class – http://www.wallwisher.com/wall/miordenador Looked impressive so I decided to have a go! My resulting wall is on the theme of Los planetas, linking into Yr5’s topic this term. I’ll be inviting pupils to join in later on in the topic. This to me is a little like Tweeting and blogging at once. There is a limit to how many characters you can use so pupils are not expected to write a long post which I feel will appeal! Thanks Jimmy for the heads up! 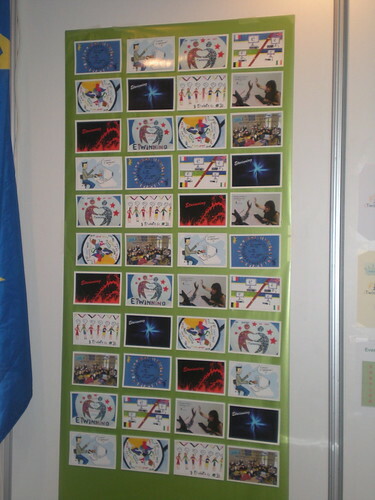 eTwinning conference Prague 2009, originally uploaded by lisibo. I’ve been blogging all weekend from the European eTwinning Conference in Prague on the special blog set up for the event. I’ve also been tweeting our activities when I’ve had a chance. 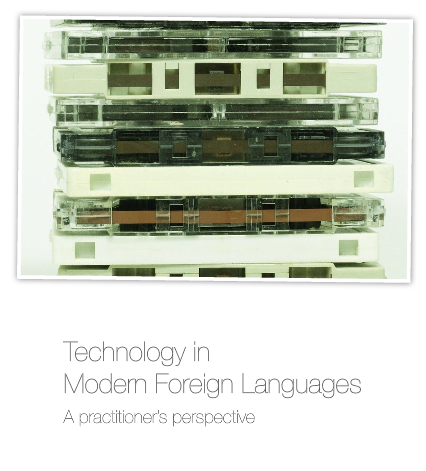 Many of you will know of Joe Dale and follow his marvellous blog, Integrating ICT into the MFL classroom. Joe is an SSAT Lead Practitioner and as part of his role, he delivers an SSAT seminar each year. 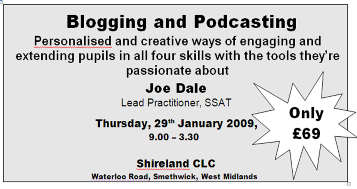 This year he ran a day in Colchester on Blogging and Podcasting, and I am really pleased that he is going to repeat that day in the Midlands soon – on Thursday 29th January at Shirelands CLC to be precise. 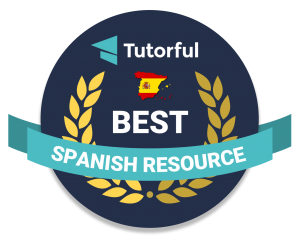 I can thoroughly recommend Joe’s seminars as they are always very instructive and full of ideas for enhancing language learning – and the ideas are all easily transferrable to other areas of the curriculum so it would be easy to share the outcomes with your whole school and for everyone to benefit. I’ve mentioned EdTechRoundup on ¡Vámonos! before and have to say that I continue to be enlightened each Sunday night (when singing permits) by the chat about all things technological (and not so technological!) at the weekly Flashmeeting. 6000 hits – ¡no lo creo! 6000 Views, originally uploaded by andrew_mrt1976. Whilst Spain were playing Italy this evening, an exciting thing happened to my Hit counter on ¡Vámonos! – it topped 6000! As it reached 4000 in April – 26th April to be precise, that’s less than 2 months to amass another 2000 hits. I’m impressed! In my 4000 hit post I said ‘Here’s to reaching 5000 by the end of the summer term’ – seems I need to aim higher!